Welcome to the 22'th chapter in a never-ending series for operating system development! This is more then chapter 22 but also year 2 for the OS Development Series. To spice things up, however, and introduce something new, we will also be looking into Virtual FileSystems (VFS). This will allow us to interface with any filesystem driver and different disk devices in the same way. It can be used for both local disk drives, but can also be used to interface with any network filesystem. A File System defines a logical way to read and write information. In this way, it can be coinsidered a specification. Most PC file systems are based off of the desktop concept of files and folders. There are alot of different kinds of file systems. Some are widley use (Like FAT12, FAT16, FAT32, NTFS, ext (Linux), HFS (Used in older MACs); other filesystems are only used by specific companies for in house use (Like the GFS - Google File System). Some filesystems are used in networking only (NFS). You can also develop and design your own file system implimentation. File Systems are used for data storage and organizing data. They help provide a straightforward way to access files and directories on removal media (floppies, flash drives, CDs, DVDs), local drives (hard disk drives), and network clients. File Systems can also exist as an in-memory image. For example, you can load a file that containes a "foot print" of a special type of file system in it. A file is a group of data that represents something to a program or to the user. This data can be anything we want it to be. It all depends on how we interprate the data. For example, a text file containes text information. A file can also be an image of something. A folder is a logical group of files. It is also known as a directory. Directories provide us a way to manage a large amount of files. Directories typically form a tree structure. This is known as a directory tree. There is only one directory that is the parent of all directories and files: the Root Directory. A File Path is the location of a file in the directory tree. For example, the file a:\myfile.txt, myfile.txt is the filename. It is in the root directory at the device known as "a:". a:\mydir\myfile.txt is a file, myfile.txt, located in the subdirectory, mydir, that is, in turn, located in the root directory on device "a:". 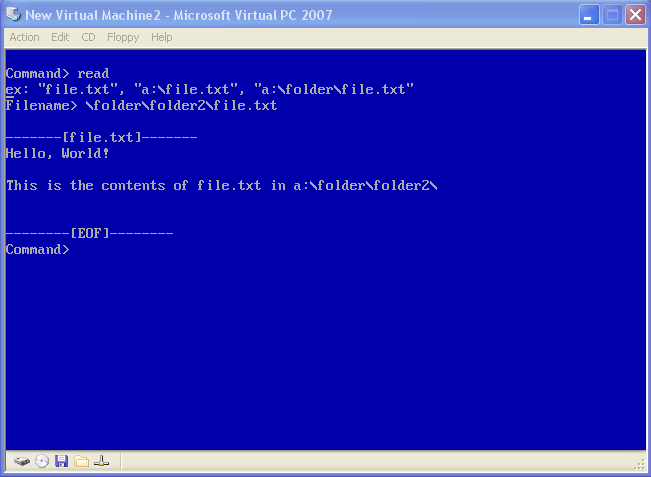 The name of a folder or file is a string representing that file or folder, usually by its contents. File Systems impliment file naming and folder naming differently, and each has their own constraints. For example, FAT12 stores filenames and folder names in a directory entry as an array of 11 bytes (8 for filename, 3 for extension. This is also known as the 8.3 naming convention) This limits file names and folder names to 11 characters. On the other hand, NTFS is limited to 255 characters with Long File Name (LFN) support. NTFS, for another example, stores file names along with file attributes in a Master File Table. Most filesystems file names are not case sensitive. However, some filesystems may store filenames differently internally. For example, you may have found out that you can have an 8.3 lowercase file name for a file on the floppy disk, but be able to load the file from your OS by using an all uppercase file name. Windows displays the LFN of the file name, while FAT12's 8.3 file entry only containes its 8.3 all-uppercase file name. This is what makes it possible. Symbolic links are a way to provide shorten paths. For example: a:/folder/link.lnk points to a:/otherfolder/subfolder/subsubfolder/yet another folder/link.txt. Now you can access the text file easily. Symbolic links are also very often used to make folder organized. Like the Windows Start Menu. Contains symblic links to your programs. A symbolic link is not very hard to implement. You find the node given (which is the link). It seems to be a link, so you get the real path and read that file instead. Windows Shortcuts are a type of symbolic link. A type of InterProcess Communication (IPC) is called a pipe. A pipe is a virtual file, usually between two or more processes. The best example may be stdout, stdin and stderror on Unix. They are handled as normal files, but the data written to stdout show up onto the screen (or in stdout.txt). Some filesystems also impliment special files and folders specifically for filesystem use. Typically you cannot have two files or folders with the same name (nor a filename sharing the same name as a folder) in the same directory. Because of this, naming a file or folder with one of these hidden files may also not be possible depending on implimentation. For example, NTFS provides several metafiles for filesystem use. These files are located on the root directory of the system drive (typically C:). $MFT,$MFTMirr, and $LogFile are a few of these files. While they do not ever show up even when view hidden and system files are checked, watch what happens when you create a file with one of the above names there. You can create those files anywhere else, but you will get a "file already exists" error when creating one on the root directory do to the metafiles. Because these names have special meaning in DOS and Windows, you cannot name a file or folder any of the above names.
. and .. are special files some file systems impliment. '.' is the file name of a file that containes file information that referrs to the current directory. '..' is the file name of a file that containes information that referrs to the parent directory of that file. For example, if there is a file located at c:\mydir\file.txt, and c:\mydir was the current directory, the pathname .. will refer to C: while the pathname . will refer to c:\mydir. A Flat File System is a filesystem that does not support subdirectories. Instead, all of the files are in the same (root) directory. Many early computer systems used flat file systems. Modern operating systems typically impliment more advanced hierarchical file systems. While small and easy to impliment, flat file systems are hard to orginize. This type of file system uses a "journal" of file system changes. This is a log of changes the system intends to make to files or directories prior to completeing the steps. This insures that, if a crash occures during a filesystem operation (like writing a file), the journal can be read to undo the changes made to repair the filesystem. While a file system defines a specification for reading and writing "files" and "directories", a file system driver containes the implimentation of a specific type of file system. A good example of a file system driver is ntfs.sys which containes Microsoft's implimentation of the NTFS File System. File system drivers are also sometimes implemented as minidrivers inside of larger software. Bootloaders are a good example. Because boot loaders have to be able to load files from disk without a separate driver program, they contain several filesystem minidrivers for different types of filesystems inside of the bootloader itself. If you developed the bootloader in the series, you have already experienced the FAT12 file system and developed a FAT12 minidriver for our bootloader. A Virtual File System (VFS) is an abstraction layer ontop of specific filesystem implimentations. The software accesses storage devices through a VFS. This allows the software to read or write to different storage devices without any knowledge of the device or filesystem that is being used. It also allows the same code to work with any number of installed filesystems or devices. The basic idea is to allow a single system interface to work with any filesystem in a uniform way. Windows, Linux, and Mac OS all support VFS in different ways. There are different ways to impliment a VFS. A mount point list is a list of mounted file systems and where they are mounted. For example, if a file needs to be read from, the OS typically calls the VFS ReadFile() function which searches through the list of mounted file systems to locate the device and file system the file is in. It then passes the read request to that file system's ReadFile() function. A Node Graph contains a graph of nodes that represent files of different types: files, folders, mount points, etc. Each file node structure typically containes function pointers to file system-specific routines for reading and writing files. This allows the filesystem-defined routine to be called. DOS and Windows assigns a letter from 'a' through 'z' to represent a mounted file system. Windows keeps a symbolic link between a drive letter and its Object Manager name. For example, the drive letter c: (symbolc link name \\GLOBAL? ?\C:) may be mapped to the Object name \Device\HardDiskVolume1 device object. A File System can register themself to own a device object. If a file system is found to own the object, the rest of the file path name ("myfile.txt" in this example) is passed to that filesystem's FileOpen() function. Windows supports assigning drive letters to devices and partitions representing mounted file systems. (During boot, if no filesystem driver registers to own a device object, Windows uses its RAW minidriver for the devices.) Drive letters can also refer to network shared drives, virtual disk images, or a symbolic link to another location in the local or a network client. However, they are limited to 26 devices do to only 26 letters that can be used from 'a' to 'z'. For simplicity, we will be using drive letter assignment along with a mount point list in our VFS implimentation. Our implimentation needs to be simple because we do not have device management nor I/O management in the OS presented in the series. I personally recommend developing the VFS first prior to the filesystem driver. This way the interface and framework of the VFS will have already been completed. Anyone that has used C is already famalier with the infamous FILE* data type. FILE* is an Abstract Data Type (ADT) that represents a pointer to a file object. ISO C defines that C implimentations must define a FILE type, however does not define what is inside of the structure. That is, while FILE* is ISO C, the structure contents is implimentation-defined. That was easy, huh? id can be used for idenitification purposes if you like. device represents the device the file resides on. There are alot of different types of files that we have talked about: files, directories, symbolic links, etc. For simplicity, we will only focus on files and directories. These will be used in the flags member of our FILE structure above to represent the type of file. Open and Close operations perform opening and closing a file object (file or directory, whatever the file type is), while reading and writing operations perform reading and writing the file type. All of these are exposed to the programmer through the standard C file I/O functions. For example, lets say we call the C fopen() routine. That will call our volOpenFile() routine which returns a FILE object. We passed a path to the file, like "a:\myfile.txt". The Volume Manager indixes into the mount point list and verifies that a file system has registered for the device ID that represents 'a'. If it has, it calls that filesystem drivers FileOpen() method passing "myfile.txt". Dont worry if it sounds complicated. It can be; but the design of how its implemented in the demo is very easy. The first thing we need is a way to abstract filesystem-specific information. This includes the name of the filesystem and the operations that can be performed on files. This is done using function pointers. The Volume Manager impliments our VFS in the demo. Its in the files fsys.h and fsys.cpp. Remember that we will be using drive letter assignment to represent devices? Because there are 26 possible devices, it is helpful to make a constant, DEVICE_MAX. Because each device can only have one mountable file system, we store them in a list (like a mount point list). Here is how it works. Because we are storing the filesystems as a list of pointers, if a pointer is valid, the filesystem has been registered there. Each element in the array represent the drive letter that it refers to. So 'a' is ar _FileSystems, 'b' is at _FileSystems, etc. It is the filesystems responsibility to manage the disk that they are writing on. Using this method provides a very basic but easy way of accessing devices. For example volOpenFile() only needs to check the first character of the path (the drive letter) and do a lookup into the list to see if a filesystem is registered for that device. If it is, it can call that filesystem's open() method and pass the filename to the driver. We default to using 'a', however if the input path contains an ':' then we use the first character for the device instead. This allows us to call volOpenFile in two ways: passing a string like "myfile.txt" and "a:myfile.txt", where "a" is the device the file is in. Cool, huh? All of the other file operation routines are basically the same. Knowing how our VFS is storing filesystems, you can probably guess how volRegisterFileSystem() family of routines work. All they basically do is store a pointer to the filesystem in the list or clear it. Alright then! So we initialize the filesystem driver, which calls VolRegisterFileSystem() to register itself. We call fopen(), which calls VolOpenFile(), which in turn calls our filesystem's open() method. Everything is now in place but we are missing something... something very important... the filesystem driver itself! We have looked at and implemented FAT12 two times in the past throughout the series. Because of this, I do not plan on covering FAT12 in great detail again. However, this will be a review of FAT12 along with the C driver code and how it works. If needed, please reference Chapter 11 while reading. Remember that alot of important filesystem information is stored in the boot sector along with our boot strap program? More specifically, it is located in the Bios Paramater Block (PBP) located in the boot sector. A good example of what the boot sector looks like is to think about what our Stage 1 Bootloader program looks like in memory. The very first instruction in Stage1 (Please see Chapter 4's demo, Stage1.asm) was jmp loader. This is a three byte instruction, so the first 3 bytes in the above structure is the Operation Code (OPCode) of our jmp instruction. Also remember from Chapter 4 that we have covered the OEM Paramater Block (aka, Bios Paramater Block (BPB). The BPB is located right after our 3 byte jump instruction. Because of this, the BIOSPARAMATERBLOCK is next in this structure. I also provide the BIOSPARAMATERBLOCKEXT structure which is an extension to the BPB for some other file systems, such as FAT32. The last 448 bytes of the bootsector contain the rest of our boot sectors program code. Because its not important to us right now, we just treat it as padding in the Filler member. This insures the BOOTSECTOR structure is exactally the same size as our on-disk boot sector (512 bytes). BIOSPARAMATERBLOCK is a structure that defines the format for a BPB. It is the same structure that is in the boot sector and has been covered in more depth in Chapter 5. BIOSPARAMATERBLOCKEXT, however, may be new. While we have already covered the BPB in depth and used it in the past for FAT12 parsing, FAT12 bootsectors do not rely on the BPB extended members. FAT32, however, does. We read the sector using our floppy disk driver that we developed in the previous chapter. Now that we have our BPB information in memory, we need to prepare the filesystem for use. We start this by first deciding what information we need. Okay... Remember that we already have the bootsector stored in our BOOTSECTOR structure? Knowing this, we can simply copy over some of the information from the BPB to our MOUNT_INFO structure. Notice that there are two FATs. The first FAT is right after the boot sector on disk. Because of this, we set fatOffset in MOUNT_INFO to 1. Also note that the Root Directory is right after both FATs. Knowing this, we can come up with a simple calculation to find the starting sector of the root directory. (NumberOfFATs * sectorsPerFAT) + 1. We need to add 1 for the bootsector. We now have the location of the first FAT and root directory. To find the size of the root directory, all we need is the number of entries in the root directory and the size of each entry. Each directory entry in FAT12 is a specific structure format that is 32 bytes in size. So all we have to do is bootsector->Bpb.NumDirEntries * 32. This is the number of bytes the directory takes up. We divide it by the bytes per sector to convert it to a sector count. That is all that there is to it :) This is a directory entry - the information stored in our DIRECTORY structure can be a subdirectory or a file. Filename and Ext containes the file or directories 8.3 format name. Please note that we will not be using this in the series as it is not needed. However, you can provide support for working and setting file attributes in your own system if you like. Because we have no need in modifying or retrieving file or directory date or time information we are not using them in the series. However, I encourage our readers to add the functionality themselves later on it they like. Remember that, for a FAT12 formatted floppy disk, a cluster is the same size as a sector (512 bytes). Because of this, the FirstCluster field in DIRECTORY also points to the first sector of a file. Thus, by reading this sector, you effectively read the first 512 bytes of the file. Remember that a directory containes a list of directory entry structures. Knowing this, parsing the directory to find a file or directory becomes very easy. We begin with loading the root directory. Remember that we retrived the root directory sector from the BPB when we mounted the filesystem and stored it into _MountInfo.rootOffset. Thus, all we need to do is to load the sector, and use a DIRECTORY* to access the directory entries. Then we loop and compare filenames to find a match. We convert the input filename to its DOS 8.3 filename format using ToDosFileName(). For example, turning the input filename of "Myfile.txt" to the FAT12 internal format "MYFILE TXT". We read in a sector and compare each entry in the sector. You will also notice that we turn the filenames into C strings so we can use a simple strcmp() call to test if filenames match. When we found a match, we fill out our FILE structure and return it. DirectoryName contains the directory or file name we are wanting to find. We convert the input filename, like "myfile.txt" into its DOS 8.3 filesystem format "MYFILE TXT" and store it in DosFileName. We are reading from the root directory. The root cluster is stored in _MountInfo, which containes information obtained from the Bios Paramater Block (BPB) when the file system was mounted. _MountInfo.rootOffset contains the first cluster of the root directory. The root directory contains, at most, 224 DIRECTORY entries. A DIRECTORY entry is 32 bytes, 224*32=7168 bytes, 7168 bytes / 512 bytes (512 bytes in a cluster) = 14. This means the root directory consists of 14 clusters. Knowing this, rather then loading the entire directory at once, we can load it sector by sector and parse each part of the directory. Knowing that a DIRECTORY entry is 32 bytes, 512 bytes per cluster / 32 bytes = 16. This means there are 16 DIRECTORY entries in one sector. So, we loop through each entry and compare filenames to locate the file or directory that we are looking for. If they match, we can create a new FILE object and return it. file.currentCluster will contain the first cluster of the file for reading later, file.fileLength contains the size of the file, in bytes. directory->Attrib contains the files attributes. We set it based on its DIRECTORY entry attribute. Almost there... If we have not found the file or directory yet, we just move onto the next DIRECTORY entry. If we never find the file, we set FS_INVALID and return. Thats it! The above routine works for directories and files in FAT12. By calling it, it will search the root directory for any folder or file name and return its information. While the old version of FAT12 was flat, new versions of this file system supports subdirectories. This allows us to be able to use directories and manage a lot of files more easily. For example, it would be a good idea in a large OS to separate OS-specific files in a system directory, or a user directory containing user profiles. A subdirectory is just an ordinary file with the DIRECTORY flag set. Because of this, we first need to know how to read files so lets look at that now. Okay, so we can now parse directories and locate files. We now need a way to read the file's contents. Remember that, technically, we can already read the first 512 bytes of any file by just the FirstCluster field in the directory entry structure for that file. To read more then one cluster, we have to parse the File Allocation Table (FAT). Recall that FAT consists of a number of entries containing cluster numbers. The size of these entries depends on the filesystem. FAT12 has 12 bits per entry, FAT16 has 16 bits, FAT32 has 32 bits per entry. Think of the FAT as - not as a linked list, but rather a table of entries that represent the whole physical disk. The first cluster of the disk is represented by the first entry of the FAT. The second cluster is represented by the second entry, and so on. This means there is a one to one relationship between a cluster and a FAT entry. This makes reading and writing files in FAT12 easy. To read a file, we just read the current cluster of the file. We try to locate its next cluster on disk by parsing the FAT table. After we find the next cluster, update the "current cluster" for the next file read. The cluster to read was set when the file is opened. On the first call to this routine, file->currentCluster is the same as DIRECTORY->FirstCluster. Remember that each FAT takes 9 sectors. Because there are two FATs, 9+9=18. We have also concluded that our root directory is 14 sectors in the previous section. 18+14=32. This is the amount of sectors both FATs and the root directory take up. So far our equation is 32 + file->currentCluster. We need to subtract 1 and we have 32 + (file->currentCluster - 1). This is the sector to read in and containes the file data. To read in the next cluster we have to parse the FAT tables. Because a FAT table is 9 sectors, rather then reading all 9 sectors we determin what sector we need to read. We first get a byte offset into where the next cluster will be in. To do this, we multiply the cluster value by the size of a cluster. This gets stored in FAT_Offset. The size of a FAT32 cluster is 4 bytes, so we would mutiply by 4 is we are using FAT32. We would multiply by 2 if we were using FAT16 as that uses 2 bytes per cluster entry. Thats all fine of course, but what about FAT12? FAT12 uses 12 bits per cluster entry. Thats 8 bits (for the 1st byte) and 4 bits (for the 2nd byte. 4 bits is half of 8 bits, so its 0.5) so its 1.5 bits per cluster entry. After this, just divide this byte offset by the size of a sector to obtain the sector of the FAT to read in. The remander is the offset in this sector, which is the cluster to read from the FAT. This is in entryOffset. FAT is defined as uint8_t FAT [SECTOR_SIZE*2]. Notice that we read 2 sectors of our FAT into memory instead of one. Why do this? Knowing a sector size is 512 bytes, 512 bytes * 8 = 4096 bits per sector. 4096 bites / 12 bits (for a FAT entry) and we have 341.3333..etc. This means that an entry will sit between the 1st and 2nd sector. This will cause problems when loading files. Because of this, we have to load an additional sector so the last cluster value of the 1st sector will not be corrupt. After the FAT sector has been read, we read in the cluster number. Now we run into a problem. If we read an 8 bit value, we will not be able to read the whole 12 bits of a cluster value. So, we read 16 bits instead using an uint16_t. Of course, now we have the problem of having to much bits of our 12 bit value. Note: Binary numbers seperated in bytes. Each 12 bit FAT cluster entry is displayed. Notice all even clusters accopy all of the first byte, but part of the second. Also notice that all odd clusters occopy a part of their first byte, but all of the second! A SubDirectory is a file with the DIRECTORY attribute set. To read from a subdirectory, all we need to do is locate the FAT12 file on disk with that directory name and read it in the same way as with other files using the FAT. After the file is loaded, from the first byte to the last is just an array of DIRECTORY entries. Parse the DIRECTORY entries the same way that we did with the root directory to read this directory :-) These will be the files and folders inside of the directory. filename contains the file or directory that we want to find. kFile is the subdirectory that we want to parse. We convert the input filename, like "myfile.txt" into its DOS 8.3 filesystem format "MYFILE TXT" and store it in DosFileName. Each DIRECTORY entry is 32 bytes. A sector (also cluster in FAT12) is 512 bytes. 512 bytes / 32 bytes = 16 DIRECTORY entries per sector. So, we loop through all 16 entries to compare names. Once we find a filename matching the one we are searching, we have found the file. When we have found the file, we fill in our FILE structure - first file cluster (so we can read it later on), file size (so we know when EOF is) and its attribute (file or directory). If the file has not been found, we just move onto the next entry. This loop will continue until the end of the file. If no file is found, we set FS_INVALID and return. Notice the simularities between this routine and our FsysFatDirectory routine. This chapters demo puts everything we covered and impliments a VFS and FAT12 minidriver. It is capable of supporting multiple filesystems, disk devices, subdirectory support, and loading and displaying files. The demo is also capable of displaying large files and impliments a "press a key to continue" feature for multi-cluster files. This demo impliments the strchr() ISO C routine in our CRT string.c to help with text parsing. It also upgrades our read command so it is capable of locating and displaying files instead of raw sectors. The Volume Manager is very simplistic in this demo, implimented in fsys.cpp. It manages the registring and unregistring of file systems, and file system abstraction. You can call volOpenFile() to open a file. It defaults to opening a:file.txt but it will also work if you call it to open any file on any directory. Not all file systems support subdirectories. Because of this, we leave subdirectory support to the file system drivers. Instead, the volume manager only handles the drive letter part of a path name. For example, if you call volOpenFile ("a:\folder\file.txt"), volOpenFile will pass "\folder\file.txt" to the file system registered on device 'a'. The file system driver is responsible for parsing the directory path name and opening subdirectories and files. In the case of our FAT12 minidriver, this special routine is fsysFatOpen() which is responsible for parsing the direcory path (like "\folder\folder\file.txt") and calls its other file system routines for parsing and reading files and directories. Thats it :-) This is possibly our last chapter covering FAT12. Because of this I do plan for an update covering writing files and directories on disk a little later. This was a fun chapter, huh? We are now able to load files from disk. I know, I know, "About time!" :) We are almost now ready to make the big leap into multitasking and executing programs. Before going multitasking, however, we should cover Loaders. A Loader is responsible for loading and executing a program, and mapping it into an address space. We also need to cover heap management and stack management in address spaces. Because I plan to update the memory management chapter heavily, I might move heap and stack management in a chapter following the memory management chapter. In any case, I will be sure to keep you updated on changes. This does, however, mean that it is almost time for us to dive into multitasking. Afterwords? User mode!